So Young director Vicky Zhao is ‘crying’ all the way to the bank. Month after month, China’s movie industry has been making major leaps that spell trouble for Hollywood’s creaking business model. China has repeatedly proved that massive profits can come from tiny investments, while Hollywood’s studios keep making enormous financial bets in the face of rapidly dwindling returns. Where China’s distributors are piling up cash with the new equivalent of a “My Big Fat Greek Wedding” nearly every month, Hollywood has increasingly churned out cash burning duds like Jack the Giant Slayer. The latest Chinese jackpot winner is So Young, a low-budget youth romance that put its financiers well into the black in just its first two days of theatrical release. After its huge $22+ million three-day weekend debut, and with the major three-day Labor/May day holiday about to start, So Young is now assured of posting one of the biggest 7-day debuts in Chinese box office history. Based on the wistfully titled Chinese young adult novel “To Our Eventually Lost Youth” (致我们终将逝去的青春), So Young is the latest in a string of Mandarin language films to employ a formula first made successful by the blockbuster hit Love is Not Blind back in 2011: adapt a successful novel (or in some cases a TV show or even an old American movie) to a contemporary Chinese context; cast popular, young, inexpensive actors; keep the budget low; choose an optimal release date, preferably a major box office holiday; leverage social media like Sina Weibo and WeChat to promote mainly to young female moviegoers; and let the box office magic happen. I’m not sure this climactic scene was included in the movie, but really, what filmmaker could resist the pathos, the dramatic power, of those lines? Kidding aside, So Young has been getting some of the best reviews I’ve seen lately for a Chinese film, with a 9.1 rating on movie fan site Douban. And distributor Enlight’s marketing team has generated tremendous buzz. First-time director and popular Chinese actress Vicky Zhao has pulled out all the publicity stops, recruiting many of her celebrity friends to tweet about the movie. Zhao also reportedly made the Machiavellian move of visiting China’s government distribution authorities and tearfully convincing them to delay Iron Man 3‘s release by five days to give her film a big market advantage during the Labor Day holiday. Her ploy worked, and although I doubt So Young needed the help, it looks likely that it will beat the Marvel/Disney blockbuster in total admissions and revenue. Whatever happens, there will be plenty of RMB to go around this week for both movies. Last year’s Labor/May Day holiday saw a total national gross of about $36 million. If current trends continue, this year’s holiday could double that amount. Other films are enjoying excellent results, with Finding Mr. Right winding down its extraordinary run at a cume of roughly $84 million. G.I. Joe: Retaliation will surpass $50 million, and The Croods has benefited from excellent word-of-mouth and will beat my earlier forecast by at least $5 million to finish at no less than $25 million, a decent total for a non-sequel animated feature. The disparities in box office expectations are becoming more and more stark. $100+ million is becoming an increasingly reasonable target for local Chinese movies, and an increasingly distant dream for Hollywood movies releasing in the PRC. If they want to keep up with the times, Hollywood’s studios ought to start putting filmmakers like Vicky Zhao on speed dial. To my friends and readers in China, 祝大家劳动节愉快（I wish you a happy Labor Day). For the first time since 2011’s Love is Not Blind, a Chinese romantic comedy has broken out in a big way at mainland theaters. Finding Mr. Right, a modestly budgeted rom-com starring Tang Wei (Lust Caution, Late Autumn) debuted in the number one spot with $12 million in its four-day opening last week, beating out U.S. holdovers A Good Day to Die Hard and Resident Evil: Resurrection. The plot of the Seattle- and New York-set Finding Mr. Right borrows liberally from the iconic 1993 American film Sleepless in Seattle and its 1957 progenitor An Affair to Remember—even down to the final romantic encounter atop the Empire State Building—in weaving a familiar tale of two damaged souls who heal each other through love. Produced by Hong Kong’s venerable Bill Kong (Crouching Tiger Hidden Dragon, The Flowers of War), Finding Mr. Right is the sophomore directing effort of Xue Xiaolu, who also wrote the screenplay. Strong reviews and good word of mouth have propelled the film to successively higher grosses each day, putting it on a trajectory to reach a final gross of at least $40 million, which would make it the second highest grossing romantic comedy in Chinese history after Love is Not Blind’s $55 million. Although A Good Day to Die Hard provided a brief respite two weeks ago, U.S. and non-Chinese films have yet to shake their 2013 PRC box office doldrums. Both Die Hard and Resident Evil dropped sharply over the weekend, and Jack the Giant Slayer managed just $1.4 million on its opening day this past Monday. Die Hard will likely finish in the mid- to high-thirty millions, down at the low end of the range I had projected for it. Sunday brought an end to the Chinese run of The Hobbit: An Unexpected Journey, which grossed just under $50 million in the PRC, for a rather modest 4.7 percent of its worldwide total. Friday will bring the release of Oz the Great and Powerful, which will encounter some healthy competition from the popular Finding Mr. Right and Drug War, a Chinese crime thriller directed by Johnny To (Romancing in Thin Air, Life Without Principle) that debuts next Thursday, April 4th. Total nationwide box office amounted to $42 million for the week, a 35 percent increase over the same week last year. Year-to-date China is still running a massive 45 percent ahead of last year, while North America is running 14 percent behind its 2012 total. I’ve often noted on this website that China’s box office will surpass North America’s by the end of this decade. If current trends continue the eclipse will occur by 2019, and possibly even in 2018. It’s becoming an inescapable fact that if you want to succeed in the film business in the near future, you’re going to have to contend with China. In China there are two ways to create a box office blockbuster. One way is to target a large, hungry audience niche, create a crowd-pleasing film, and execute a clever and effective marketing campaign to put butts in seats. The other way is for the Communist Party to decree in advance that a film shall be a hit, clear competing movies out of the theaters, and then corral filmgoers into attending. China’s first and second highest grossing domestic (i.e., non-Hollywood) films of 2011 have employed these two divergent approaches to tally up ticket sales. And while box office-by-command can certainly succeed, the more effective strategy, even in China, is to deliver a good old fashioned crowd-pleaser. In David vs. Goliath fashion, a little $1.4 million independent romantic comedy without stars or much of a marketing budget is poised to overtake a big budget, massively marketed, star-studded historical epic that had no less a backer than the Chinese government itself. How did this happen? A look at the marketing tactics behind these two blockbusters can shed some light on how movie distribution works in China. 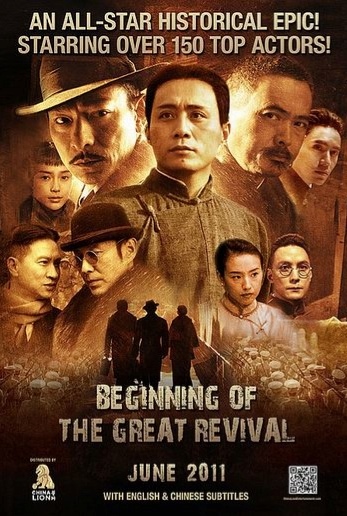 Back in May of this year, government officials were preparing to commemorate the 90th anniversary of the founding of the Chinese Communist Party (CCP) by readying the launch of their major pet project movie, Beginning of the Great Revival. Revival was a propaganda extravaganza (a “propaganza”?) funded and produced by China’s huge, state-owned studio, China Film Group (CFG). Directed by CFG’s Chairman Han Sanping, the picture featured no fewer than 172 Chinese movie stars, including such luminaries as Chow Yun-Fat, Andy Lau, Fan Bingbing, Donnie Yen, Daniel Wu, Liu Ye, and mega-director John Woo in a rare acting appearance. The CCP officials responsible for Revival’s release let it be known that they ‘expected’ it to gross at least 800 million Renminbi, or about US $125 million. This target was more an executive order than a hope or dream. It should be noted that with such a galaxy of stars, Revival would have likely cost a private film production company something like $100 million to produce. But when the Chinese government asks an actor to perform in a film, he or she is expected to work for little or no compensation. Indeed, according to director Han, the total actors’ payroll amounted to less than the cost of lunch boxes for the crew. Numerous other favors were extracted in mounting the film, so the officially announced budget of 80 million Renminbi ($13 million) understates Revival’s true cost by several orders of magnitude. But even with all the stars in the Chinese firmament on their side, government officials worried that a looming Hollywood invasion might spoil their party. With the eagerly anticipated Transformers: Dark of the Moon and Harry Potter and the Deathly Hallows Part 2 scheduled to open in Chinese theaters just a few weeks after Revival’s launch, they anticipated that filmgoers would swiftly abandon Revival’s history lessons for the escapism offered by alien robots and the English wizard boy. So the CCP did something Hollywood studio chiefs can only dream about: they shut out the competition. Completely. When Beginning of the Great Revival opened on June 15, it had a near monopoly; the CCP saw to it that the film was running on most of China’s 6,200 movies screens. Transformers and Potter were postponed indefinitely. Not a single one of those screens was to be relinquished to the American films until Revival had reached the requisite number of ticket sales. So the CCP responded by doing what it does best. It censored all the negative reviews and mobilized the population. Ticket buying campaigns were organized; huge numbers of tickets were purchased by party organizations and state-owned companies. In Changchun alone, a city of about 7 million in Manchuria, the municipal government purchased 100,000 tickets for party members to see the film. And at least some of those tickets were actually used by theater goers to see the propaganda picture. But savvy theater operators, eager to see Revival hit its numbers so that they could hustle the upcoming Hollywood films onto their screens, worked a bit of Chinese ingenuity to help the ‘propaganza’ along. They began selling tickets bearing the name Beginning of the Great Revival, but with the title scratched out and Kung Fu Panda, Fast Five, or Pirates of the Caribbean, written in by hand. This way the party got its ticket sale, the purchaser got to see the film they wanted, and the theater operator got the box office and concession business he needed. As one wag wrote on China’s version of Twitter, “Even Kung Fu Panda has joined the Communist Party.” The Hollywood studios were clearly being short-changed, but even if they found out there was nothing they could do about it. All this box office manipulation makes it impossible to say for sure how many people actually saw Beginning of the Great Revival or how much it truly earned. The officially reported final box office number—$62 million—fell far short of the party’s stated goal, and was mildly embarrassing. Still, Revival remained China’s top grossing home grown film of 2011 through the summer and into the fall, until a tiny upstart came out of nowhere to try and knock it off its perch. When it rolled into theaters on November 8th, Love is Not Blind appeared to have little going for it. With a paltry budget of just 8.9 million RMB (US $1.4 million), a cast that, while recognizable, had little if any marquee value, and a director whose last film, 2007’s The Matrimony, had barely made a ripple at the box office, the film seemed destined for a short and uneventful life in theaters. 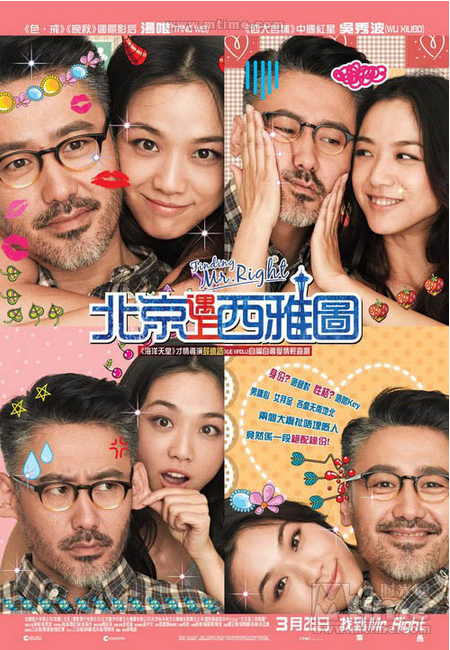 On top of its other shortcomings, Love is Not Blind’s genre, romantic comedy, was widely viewed as box office poison in China: up until that point the six rom-coms released in 2011 had averaged just $4 million in ticket sales. Furthermore, the competition that week was fierce, with one Hollywood special effects driven crowd pleaser, Rise of the Planet of the Apes, already dominating the box office, and two more, Real Steel and Immortals, set to open against Love. This time there would be no government intervention, no state-sponsored publicity blitz, no legions of party members buying tickets for the cause. The little $1.4 million picture would go it alone against a combined $350 million worth of Hollywood firepower. But for all its disadvantages, Love is Not Blind was able to do something none of the Hollywood films could. Something that Revival had failed to do. It targeted a specific Chinese demographic—singles in the 27 to 35 year old cohort—with a contemporary social issue—the ticking marriage clock—and delivered a charming, funny film with a clever and innovative marketing campaign. Love’s producing and marketing team built the film especially around single, educated women who are under pressure to marry. By the age of 27 almost every unmarried, educated Chinese woman falls into this category. The film’s protagonist, Xiaoxian, is a 27 year old “shengnu,” or “leftover woman,” whose marriage plans were heartbreakingly shattered when she discovered that her boyfriend of 7 years was seeing another woman on the side. Without much cash to spend on advertising, the Love team turned to social media, leveraging the popularity of the online novel that was the basis for the film to foster dialogue and a community around the topics of breakups and marriage. Singles, and women especially, were encouraged on sites like Sina Weibo to chat and tweet and upload videos about their own breakup experiences. The topic resonated beautifully with a very large audience. In the days leading up to the film’s release, some 6.6 million tweets were recorded on Sina Weibo, and on Baidu, China’s version of Google, the film’s Chinese title 失恋33天 (“33 Lovelorn Days”) set records for the most searches ever for a movie. Love’s release was cleverly timed to coincide with “Singles Day,” an unofficial Chinese holiday that originated in the 1990s and which takes place every November 11th. On this day single people get together to celebrate, and those who wish to change their relationship status attend blind date parties in hopes of finding that special someone. This year the holiday had special significance since it fell on 11-11-11, which, turned out to be a very popular day for movie-going. Popular especially for Love, as it turned out. In its opening weekend Love is not Blind out-grossed the combined revenue of Real Steel, Rise of the Planet of the Apes, and Immortals, collecting nearly $29 million versus a combined total of $18.5 million for the three Hollywood blockbusters. In its second week it retained the number one spot at the box office against those three films and a newcomer from Steven Spielberg: The Adventures of Tintin. Love out-paced Tintin by a wide margin, $14 million to $9 million. Most significantly, the tiny film drubbed Beginning of the Great Revival’s opening numbers: in its first week Love grossed over 50 percent more than Revival’s $18 million first week total. And even without the advantage of China’s vast Communist party machinery behind it, Love is Not Blind just might out-do Revival’s final $62 million tally. Women hold up half the sky As an old Chinese proverb favored by Chairman Mao Zedong says, “women hold up half the sky.” And with its success Love is Not Blind has proved that when the right film is marketed in the right manner, women can hold up more than half the box office. Love is Not Blind‘s success holds three key lessons for distributors and promoters of films in China. First, the market there is changing quickly, and the conventional wisdom regarding what types of films work or don’t work in China is almost always wrong. Second, women are dramatically under-served by both local and Hollywood offerings, and tremendous opportunity exists to serve this audience with good, properly marketed pictures. And finally, you can try to coerce or browbeat people into seeing your film, but the best way to reach moviegoers is to appeal to their minds and hearts. Until last week it seemed certain that romantic comedy would remain a marginal genre, far behind action and science fiction in mass audience appeal. And it was growing increasingly obvious that audience interest in locally produced films had gone cold, with the last Chinese-made breakout hit, Let The Bullets Fly, having been released nearly a year ago. And then came ‘Love.’ The surprise hit of 2011 is unquestionably Love is Not Blind (失戀３３天 ), a modestly budgeted, locally made romantic comedy that has caught fire with Chinese audiences, grossing $28 million in its opening week and crushing the competition from Hollywood, which included newcomers Real Steel and Immortals and holdover Rise of the Planet of the Apes. Given its strong word of mouth and the ongoing dearth of films targeted at female moviegoers, Love is Not Blind will undoubtedly surpass Beginning of the Great Revival as the top-grossing Chinese made film this year, and could possibly join Let The Bullets Fly and Aftershock as only the third Chinese film to reach the rarefied $100 million box office mark. Adapted from a lonely-heart blog turned popular online novel by Bao Jingjing, Love is Not Blind has been characterized by reviewers as a “Chinese Bridget Jones’s Diary.” Although it reportedly rolled out on fewer screens than were allocated to Real Steel and Immortals, Love resonated perfectly as a date movie for China’s Singles Day (11-11-11), and single-handedly out-grossed the ticket revenues of those two American films plus Rise of the Planet of the Apes combined, and by a wide margin at that. The new Chinese film’s success raises the bar for romantic comedy in China, and should open film marketers’ minds to the possibility that audiences are open to genres other than just action, sci-fi and animation. The film also solidifies male lead Zhang Wen’s (The Sorcerer and The White Snake ) status as a box office draw, while also raising the profiles of female lead He Baibai and director Teng Huatao, both of whom were previously known mainly for their work in TV serials. Disney should be disappointed with the modest showing of its Real Steel, but the true loser here is Relativity Media, whose Immortals continued the mini-major’s string of box office duds in China. The next test for Love is Not Blind comes this week as it faces off against Steven Spielberg’s The Adventures of Tintin, which cost at least 40-50 times as much to produce. Even last week Tintin seemed a certain lock to win this week’s box office crown. But given the newfound passion of Chinese moviegoers, what seemed certain just yesterday looks improbable today, and odds are that Love is Not Blind will topple Tintin to retain its number one status in China. Rob Cain is a film producer and entertainment consultant who has been doing business in China since 1987. He can be contacted at rob@pacificbridgepics.com.